The bitterroot was a beloved flower of Montanans prior to the 1893 Chicago World's Fair (The World's Columbian Exposition), but it was not until after the fair that the bitterroot gained official status by an act of the Montana Legislature. The bitterroot's rise to officialdom appears to have begun around 1891 when the Montana Women's Christian Temperance Union (WCTU) replaced their "little blue flower that grows near the snow banks" with the bitterroot as their official state flower. In 1893 the bitterroot was Montana's contribution to the World's Columbian Exposition. Also that year, in response to a national WCTU program, WCTU activist, mother and journalist Mary Long Alderson of Bozeman began her crusade to persuade the Montana Legislature to officially adopt the bitterroot as Montana's state floral emblem. Taking action in January 1894 by forming the Montana Floral Emblem Association, Mary Alderson almost single-handedly pushed her mission ahead. She helped form floral emblem committees at the county and community level initiating meetings in major cities in towns. Her goal was to hold a statewide election over the summer of 1894. Registration procedures were set at a county level throughout the state. Ballots were provided to all registered men and woman who had shown interest in choosing a floral emblem to represent Montana. The cut-off date for return of the floral emblem ballots was set for September 1, 1894. Perhaps with some help from her husband Mathew William Alderson, business manager and part-time editor of The Avant Courier , newspapers began promoting the referendum, advertising the voting rules and the candidates. Newspaper editors picked sides, expounding on the virtues of their particular choice. From across the state, 5, 857 ballots were returned to the Montana Floral Emblem Association. Votes were cast for thirty-seven different flowers with the first, second and third place winners receiving over 86% of the vote. The bitterroot beat its rivals handily, winning 62% of the total vote. Evening primrose - 787 votes. Wild rose - 668 votes. All others - 781 votes. The statewide referendum was only the first step to officialdom for the bitterroot however. With the same zeal she had taken to establish the Floral Emblem Association and complete the statewide public referendum, Mary Alderson jumped into the effort to persuade the Montana Legislature that they should adopt the bitterroot as Montana's official floral emblem. At this effort too she was successful and it didn't taker her long. 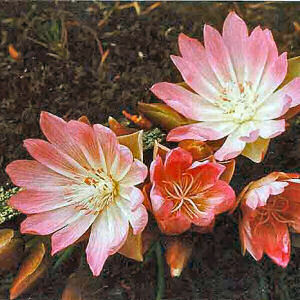 By an act of the Montana Legislature, bitterroot (Lewisia rediviva) was adopted as the official floral emblem of the State of Montana, effective February 27, 1895. The following information is excerpted from the Montana Code , Title 1, Chapter 1, Part 5, Section 1-1-503. 1-1-503. State floral emblem. 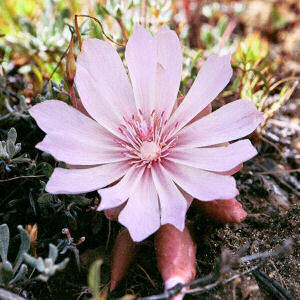 The flower known as Lewisia rediviva (bitterroot) shall be the floral emblem of the state of Montana. History: En. Sec. 3282, Pol. C. 1895; re-en. Sec. 2097, Rev. C. 1907; re-en. Sec. 530, R.C.M. 1921; re-en. Sec. 530, R.C.M. 1935; R.C.M. 1947, 19-115. Lewisia rediviva (Bitterroot): Plant Encyclopedia from MyGardenGuide. Plant Profile for Lewisia rediviva (Bitter Root): USDA, NRCS. 2004. The PLANTS Database, Version 3.5 (http://plants.usda.gov). National Plant Data Center, Baton Rouge, LA 70874-4490 USA. A Family Affair: The Aldersons, Part II: Read about Mary Long Alderson in this article from The Bozeman Daily Chronicle .